The regular exhibition, organized by the international exhibition brand ShowFX World, was successfully held on December 4-5 in Moscow. One of the most luxurious Moscow hotels - Courtyard by Marriott Moscow City Center opened its doors for exhibition. The representatives of almost all fields, providing services at the financial markets, participated in the exhibition: brokers, dealing centers, investment companies, training projects, financial publications, and regulatory organizations. ShowFX World 2009 became a unique opportunity for the companies-participants to show all their competitive advantages and opportunities not only to the guests of the exhibition and each other, but also to the potential partners. There were among the participants of the exhibition the leading companies, providing forex-services: UWS, InstaForex and LiteForex. The leading educational project International Trading Academy Masterforex-V was also participating in exhibition. Apart from brokers and educational projects the representatives of the stock magazine "F&O", news agency "MFD.ru" participated in the exhibition as well as Status Investment Broker Company, which is the expert in the investment financial consulting and provides the unique services at Forex market. The Russian Association of Financial Market Members (the RAFMM) became a special guest of the exhibition. The registered certificates were presented to all participants in the course of the exhibition. According to the results of ShowFX World Moscow Expo 2009 the winners in the following nominations were determined: "Best Software Developer - Metaquotes", "Magazine About Exchange Business 2009 - Futures and Options", "Best News Agency 2009 - ForexPros", "Best Web Magazine For Traders 2009 - FxMail.ru", "Best Media Resource 2009 - Fxstreet.com", "Best Investment Broker 2009 - Status". "SL": Good day Ahmat Khamidovich! 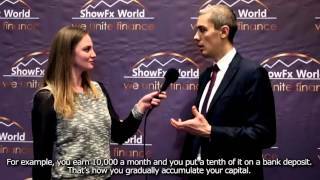 You represent the International Trading Academy Masterforex-V at ShowFX World 2009? "SL": Before we start our interview I want to congratulate you and Academy`s management and auditory with a winning in nomination - "Best Forex-Educational Project in Europe 2009". A.B. : Thank you very much! "SL": In your opinion what is the recipe of success of Masterforex-V Trading Academy? A.B. : Every person who starts trading at the financial markets, including Forex market, sooner or later starts feeling the lack of knowledge, learnt from a numerous books about Forex or at different lectures, which are held by the dealing centers and thematic Internet resources. Having learnt all described rules and techniques, trying to choose one of the famous "profitable" trading strategies, trader continues to lose again and again his/her assets. It is rarely when you can receive some profit, but this is so unstable that it is needless to say about successful conscious trading. Our Academy was founded in 2005 and up to now is a unique educational resource, because right here at first started the examination of price movement LOGICS, this allows to see well-formed system in the chaotic movement. Just that, in my opinion, attracts traders from the first days of education in Academy. A new view for a great number of popular (and not understandable on practice) moments of trading allow traders for the beginning not to lose assets at least. I think that such international acknowledgement of Masterforex-V Trading Academy is already a result of numerous discoveries in the area of technical, wave and fundamental analysis of trading. The innovations with the great success are applied by the listeners of Academy in the daily practical work, a lot of students and graduating students of Academy are the winners of Russian and international competitions on trading. "SL": Why Masterforex-V Academy is called international? A.B. : Masterforex-V Academy is the largest independent international educational project about trading, created by the professional traders and investors of the Russian Federation, Ukraine, the Republic of Belarus, Kazakhstan, Moldova, Lithuania, Switzerland, the USA and other countries. Several thousands of people from different countries of Europe, Asia and America study now in the Academy. The English-speaking forum is working together with Russian-speaking. In future it is planned to start the forums on the other languages. In the international aspect the developing process is continuing and I think that there should not be a stop. "SL": Please tell us what the internal structure of the Academy looks like? A.B. : The education in Academy is built in the way that any person could be actively involved in the process, despite the level of the ground-base education. If a newbie comes he/she can start from the "entry level" there is a special division, consisting of 12 classes of "the school" education, having learnt this section the student enters "High school". Already at these stages with acknowledgement with classical methods of trading there is made a special reference to the detection of lacks of one or another approach, on the lack or even absence of explanation of important trading moments, because of this the statistics of lose traders looks so disappointing. The next stage is the preparative faculty and then the basic. Here the gained knowledge is attended with daily practice, a trading in real time mode. However, it should not be expected the achievement of prepared trading signals. At the practical exercises during the trading in real time mode there is a near work on the decoding of price change. Using the approaches, methods and strategies, developed in the Academy, the condition of the market is analyzed for the present moment and possible variants of its development in future. Besides, there are different directions of additional advanced study of one or another aspect of market trading in Academy, we have different departments of advanced study. Having learnt the basics of similarly-named method Mastreforex-V, trader can choose the trading style, which is more appropriate to his/her individuality, character and psychological status. Somebody likes the short-term trading, others long-term. Some traders prefer to work at Forex market, the other at shares, options, futures or commodity markets. In my opinion, only when you find your own niche, you can work successfully, other way you will lose time, assets and health. At the faculties and departments there is a work on the solution of the significant problems and correction of mistakes of classical technical analysis, which was developed in the works of Dow, Elliot, Murphy, DeMark, Bollinger, Sperandeo, Elder, Hartley, Shwager, Larry Williams, Prechter, Neely, DiNapoli, Nyman, Gartley, etc. Also new patterns of technical analysis and trading indicators are developed for faultless profit gaining. Open classes, trainings, master-classes and video conferences of professional traders on application of different trading systems at the leading world exchanges are available at the numerous faculties and departments of Academy. The important place in the structure of Academy are given to the questions of psychology, juridical literacy, and also questions of interrelation of traders and dealing centers, traders and brokers, traders and investors, and a number of different aspects of traders life, without the correct understanding of which there can not be a successful trading. Now in the framework of Academy a new project is started "Community of traders and investors of different world countries and regions", this project unites people, working at financial markets from more than fifty countries all over the world. There is a great library in Academy, as well as subforums created for the informal communication of traders on any subjects. "SL": Ahmat Khamidovich what is the major method of analysis taught in Masterforex-V Trading Academy? A.B. : The analysis method, which is used in Academy, can be called as Masterforex-V method. This definition includes the usage of different analysis tools, the classical one as well as the unique, developed in Academy. Having synthesized the information, received with the usage of these tools in a special way, trader can see the objective picture of market`s condition for the present moment in real time mode, and not after the one or another picture of technical analysis appeared in the history, or the price has already left all its reserve of movement. We call such approach as synthesis of binary regularity. At first look, the fundamentalism of trading strategy Masterforex-V amazes with analysis depth of physical principles of price movement, but with that, having been logically connected, on its internal structure, it is easy for understanding in the frameworks of first education year in Academy. "SL": As I know you have the great experience of work as a trader. How much time do you think it is needed to become a professional in trading? A.B. : I can not say that I am too experienced. The profession trader as any other requires the serious attitude to the education process and establishment. In order to become a specialist in any sphere of life, the person should graduate from the university; undergo a study course, several years to gain a personal experience of practical work. However, with all this knowledge, only small number of traders becomes a good specialist in trading. The same thing can be said about trader`s specialty. If you plan to make this profession as the business of your life, than you will learn during your whole life, even if your trading is stable and profitable. "SL": Why does the learning of trading take so much time, in fact the mechanism of trading is rather simple - you bought cheaply and sold expensively? A.B. : Because, the life each time sets up new claims to us, and if we can not adequately set our own individuality in accordance with this claims, then, most probably we will "stumble" or "fail" and, in the end, we will leave trading forever. Besides, it should be taken into account that managerial decisions at the financial markets should be taken by professionals, who have the fundamental education, and only at the basis of the careful analysis of the available information, taking into account the estimations of possible variants and risks. Even if the model is built precisely, the practical forecasting and management of the appropriate system can become impossible, because of influence of external factors or irremovable mistakes of measures. "SL": What tools and methods do you use in decisions making? A.B. : Today there are a lot of different fundamental trading systems and methods of market`s forecasting, as well as technical, for the prediction of prices the wide range of tools is used, among which are traditional methods of extrapolation and rather difficult decisions, based on neural network technologies. There are a lot of discussions concerning these methods and also new mechanisms of market prices` assessment and forecasting of quotations` changes are introduced. However, these discussions do not touch upon the key question: is it possible to forecast the market with the usage of these methods? In view of the fact that the financial markets represent by themselves the example of difficult system with high grade of uncertainty, a lot of accidental factors influence these systems and for the successful work at these markets it is necessary to take into account these accidents. I think that you understand that in a whole the targets of the successful forecasting can not be solved with the help of mechanical application of the established traditional methods, which can be learnt at the weekly educational courses for newbies. That is why I use in my work the major toolkit of trading system Masterforex-V as well as other instruments, which I continue to learn and trying to set up for myself. "SL": Ahmat Khamidovich, were the numerous visitors of exhibition interested in the details of trading on new trading systems, developed in Academy? A.B. : The exhibition visitors were interested what the difference between Masterforex-V and other educational resources is. One of the moments which I was explaining is "synthesis of binary regularity". In two words, this is a usage of several independent events, which in the cross point at the present moment allows to determine the situation more objectively. Answering the questions of visitors I was making simple example, which I used in past for understanding. Here it is: What are you imaging when I say "Clear, shiny day...", have you answered? And now: "Clear, shiny winter day....", do you have an answer? Then one more specification: "Clear, shiny winter day in the Sahara desert or in Antarctica or ...", etc. "SL": Yes, rather unordinary system of synthesis, but is very simple on its internal logic. Tell me please, what was the most interesting for you at ShowFX World 2009? A.B. : The most outstanding moment at the exhibition for all our team was acknowledgement of Masterforex-V Academy at the international level. I think that this is only beginning, and very significant beginning. We thank the exhibition contractors for inviting us at exhibition; it was a surprise for us. 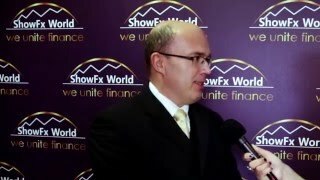 "SL": As it is well known there were a lot of leading companies, providing services of Forex market, the developers of software, educational projects, the representatives of specialized publications and news agencies, as well as the companies, which are experts in investment financing consulting among the participants at ShowFX World. How such big number of participants affected the atmosphere of exhibition? Because, in some way, all its participants are competitors. A.B. : Here at the exhibition ShowFX World 2009 was a business, friendly, calm atmosphere. According to managers of exhibition they strive to create the business atmosphere and to go away from the noisy "PR-presentation" of dealing centers barkers. One of the main targets of the exhibition was closer acquaintance of traders, investors, participants and visitors for the serious business relationship, the proposing of qualitative production for the usage at the financial markets, rendering of assistance to all interested with different trading aspects at these markets. I want to note that in my opinion, the organizers of exhibition achieved these targets, and the constructive and partnership atmosphere have only supported this. "SL": Will Masterforex-V International Trading Academy take part in future in such events? A.B. : We are ready to participate in the events of such level. We have what to say to everybody who interested in the trading theme, as well as to the professionals in this area. Our "secrets" of the successful trading are the unique authoring, about which you will not find in any book, devoted to the questions of classical stock trading and successful investment. "SL": Ahmat Khamidovich thank you very much for the interview, I want to wish you, your management and all listeners of Academy a success in work and new discoveries, and also want to congratulate Masterforex-V International Trading Academy with such bright win at ShowFX 2009! Summarizing the results of ShowFX World Moscow Expo 2009, its organizers said that the exhibition was held at high professional level, and they hope that attention and interest to the events, held by international brand ShowFX World and ShowFX Asia, will increase, and the number of participants will grow. The management of the company ShowFX World had already confirmed the fact that Moscow will become a traditional place of the events of all formants, united by the brand ShowFX World. In 2010 in Moscow it is planned to hold another event of ShowFX World Moscow Expo 2010.